The Great Salt Lake is what’s left of prehistoric Lake Bonn- eville, which covered most of what is now Utah. At 1,700 square miles, the great lake is still the largest salt water lake in the Western Hemisphere and a haven for hundreds of bird and mammal species. Best to hit one of Salt Lake City’s great breakfast stops for fuel before heading out to the great lake. Penny Ann’s Café (pennyannscafe.com) is a popular spot for “heavenly hotcakes” and omelets, and Pig & a Jelly Jar (pigandajellyjar.com) serves up PBR mimosas alongside comfort food like fried chicken and waffles. Want to make it fast? Hit The Bagel Project, (bagelproject.com) for back-East bagels and bialys. 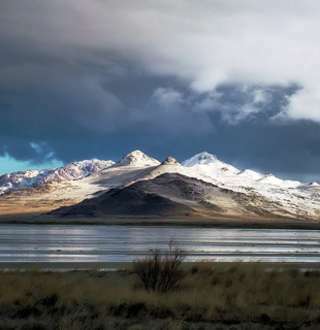 The best way to experience the Great Salt Lake is at Antelope Island State Park (stateparks.utah.gov). To reach the island, drive north on I-15 to exit 332 in Layton. Follow the signs west to the causeway. Besides the amazing views and a historic cattle ranch, you’ll find bison, raptors, coyotes and antelope. The quickest way is a 15-minute drive to the marina at Great Salt Lake State Park, 16 miles west of Salt Lake City on Interstate 80, exit 104. On the northern arm of the Great Salt Lake lies Robert Smithson’s Spiral Jetty, a 45-minute drive south of Golden Spike National Monument, about 32 miles westof Brigham City, (spiraljetty.org) a 1,500-foot basalt rock sculpture unwinding into the lake at Rozel Point. West of the Jetty, visit Nancy Holt’s Sun Tunnels (about 200 miles northwest of Salt Lake City, near the ghost town of Lucin), an installation of concrete culverts that tracks the winter and summer solstice. The works are remote, so check the weather before making either trip. Check conditions at the Great Salt Lake Institute (westminstercollege.edu/ great_salt_lake_institute). A drive along the shore of the country’s largest salt lake will confirm that it is anything but “America’s Dead Sea.” Between two and five million birds depend on the lake, its billions of brine shrimp and minerals.